In the June 2016 Edition of Modern Railways, there was an article entitled Turning South London Orange. One of the proposals in the article is to create a virtual tube through Streatham. The stations shown on the map are. 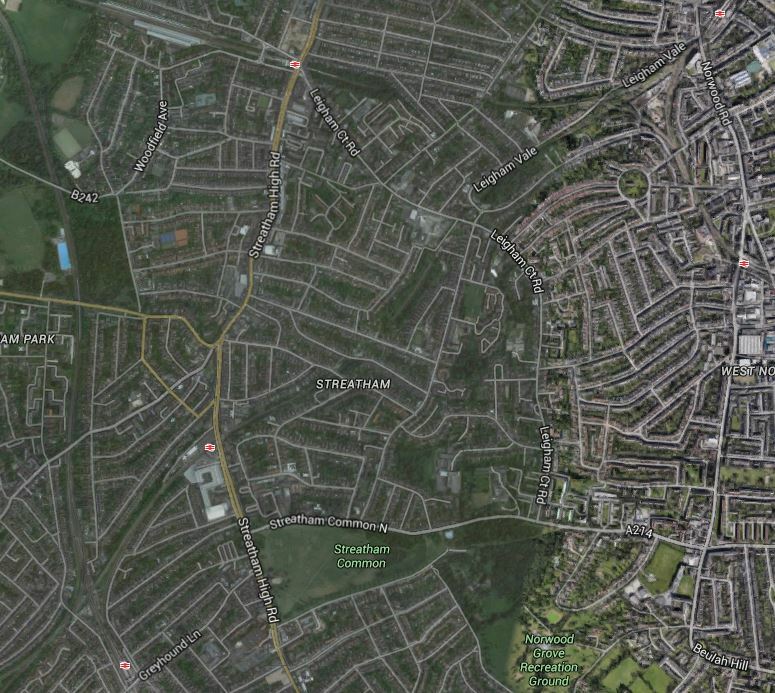 Streatham Hill station is at the top of the map just to the left of the middle. Tulse Hill station is in the top right. 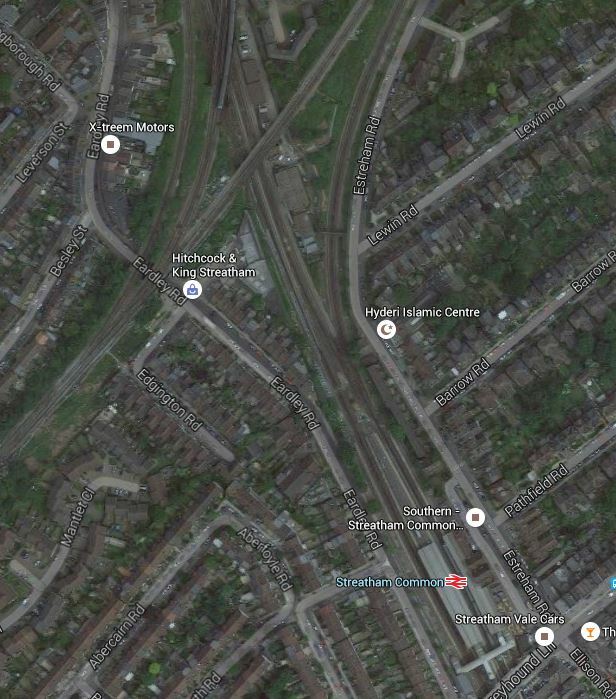 West Norwood station is on the right in the middle. Streatham Common station is at the bottom left. 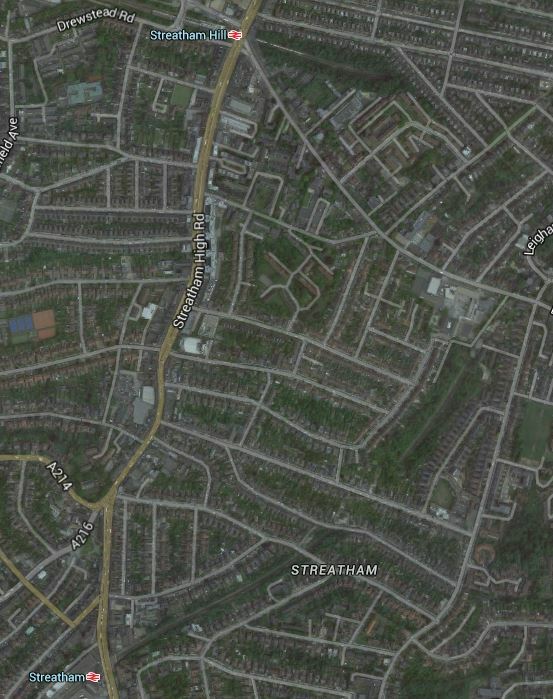 Streatham station is almost on a line between Streatham Common and Streatham Hill stations. The Modern Railways article also says. TfL has proposed the creation of a Streatham Interchange south of the town centre at the convergence of the Thameslink, London Bridge and Victoria routes near Streatham Common. But it is suggested that with such a move Streatham town centre would still be poorly served for travel in the direction of Clapham Junction, Victoria and the West End. To take a quick snapshot of the complexity of the Streatham Interchange problem, look at this Google Map of the lines in the area. In an attempt to sort the problems, the Centre for London proposing something radical in the form of a virtual tube giving a frequent service between all three Streatham stations; Streatham Common (Interchange), Streatham and Streatham Hill. The connection would be achieved by. A tunnelled flying junction between Streatham and Streatham Hill stations. 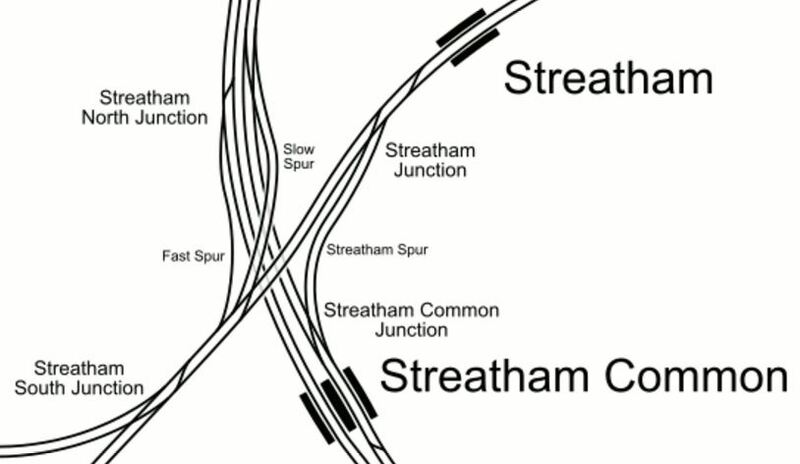 Streatham station would be four-tracked to give within-station interchange. A flying junction with the local lines would be provided at Streatham Common. This would enable some stopping services to Victoria to stop at all three Streatham stations. 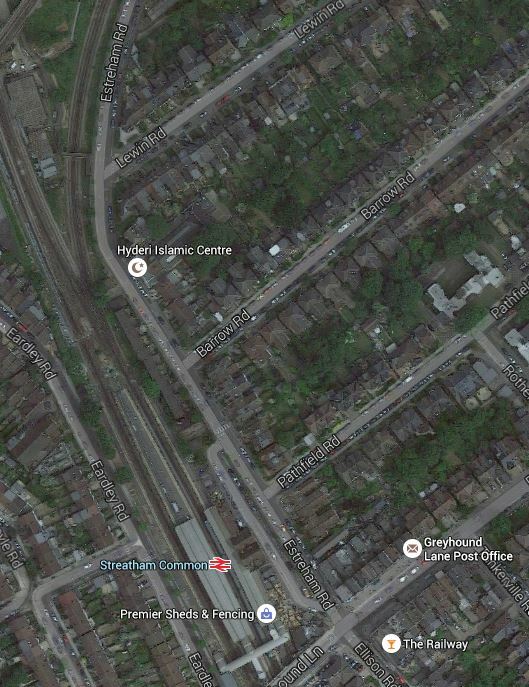 This is a Google Map of the area between Streatham and Streatham Hill stations. 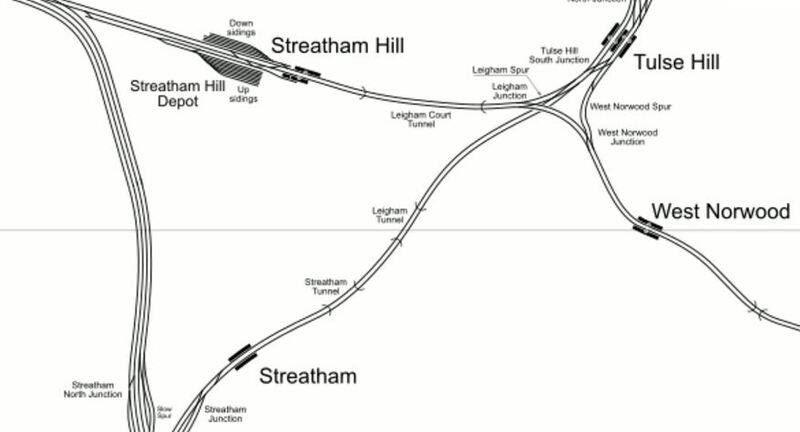 Streatham Hill station is at the top of this map and Streatham station is at the bottom. This map from carto.metro.free.fr shows the rail lines in the area. The proposed tunnel would leave the line between Streatham and Tulse Hill stations just after the Streatham Tunnel and curve Northwards to join the line between Streatham Hill and West Norwood stations, probably at the Western end of the Leigham Court Tunnel. As this is in a serious report produced by proifessional consultants, I would suspect that subject to full surveying and design, that this is a feasible idea. In the Modern Railways article it is stated to be a three kilometre tunnel. The Centre for London proposal states that two pairs of tracks with within-station interchange, should go through Streatham station. 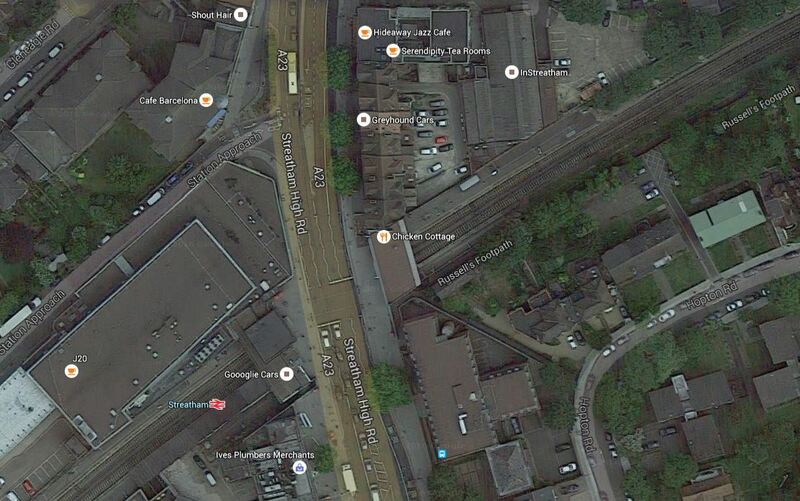 This Google Map shows Streatham station. It looks to be tight for four-tracking, but as the report says, two could be below ground. I think that there would be a flyover, so that trains going from Streatham Common to Streatham didn’t interfere with other trains going through Streatham. But there is plenty of space in the area to take the right actions! If the line through the three Streatham stations is to be a virtual tube, it should take some design clues from the Underground and its bigger and newer sister; Elizabeth. I’ve probably ridden the Northern part of the Piccadilly Line, hundreds of times and the below-ground layout of stations like Southgate, Wood Green, Arsenal and others is two platforms separated by a wide central concourse, which is linked to the surface by escalators. It is a very workable format, that is used on the Victoria, Central, Northern and Jubilee Lines and from what I’ve seen Crossrail will use the layout at a lot of Central London stations. It is a layout, that offers many advantages, especially, if the distance between the lines allows a wide and spacious area. Passengers have somewhere to wait. Some newer stations have kiosks, where drinks, snacks or something to read can be bought. Information can be bigger and better. Passengers can change easily to a train going the same way, but to a different destination. Escalators and lifts in the centre serve both platforms. Three escalators are often provided, so if one needs refurbishment, the station stills has one up and one down escalator. Toilets can be provided that serve both platforms. It is a design that has worked for nearly a hundred years and I believe that Crossrail will improve it sufficiently, so it lasts a thousand. The S Stock trains of the Underground, the Class 378 trains of the Overground, the new Class 700 trains of the Thameslink route and the new Class 345 trains of Crossrail, are all walk-through trains, which bring several advantages. Passengers can adjust themselves to the best place for their destination. Passengers can move along the train to find a seat. The capacity of the trains is larger. The Modern Railways article says this about the difference between traditionsl and walk-through trains. Analysis by TfL, has shown that station dwell times between Selhurst and Clapham Junction could be cut by up to 42%, if the current Class 377 EMUs were replaced with London Underground’s S Stock, which would be more suited to this type of operation. So the trains actually go faster, as they spen less time in the stations. The next generation of trains that replace the Class 377 trains on Metro routes in South London, may well be walk-through. I will look at the number of direct trains in the Peak and Off Peak between stations in a typical hour. I have chosen 08-09 for the Peak and 10-11 for the Off Peak. Streatham Common to Balham is included, as the proposal assumes some of these will take the new route. Frequencies are generally low compared to the 16 tph on the East London Line or the projected 24 tph on Thameslink and Crossrail. What Would Be The Termini Of The Virtual Tube? The Modern Railways article talks about Victoria and Clapham Junction being Northern termini, but what about the new station at Battersea? But the article doesn’t mention the Southern termini. So would the line go to the places shown on the map in the article; Mitcham, Selhurst, Sutton and Wimbledon? We mustn’t forget West Croydon. In How Trains Reverse At West Croydon, I investigated how trains reversed at West Croydon. There are two methods; a bay platform and a reversing siding and I reckon with some good driving and signalling and some clever timetabling, that some more trains could be squeezed in. So if the virtual tube goes ahead, I suspect that West Croydon could reverse a few trains. West Croydon station is also linked to the Tramlink. The Modern Railways article says this about the frequency of trains through the virtual tube. Using this link, some stopping services to Victoria could be rerouted via all three Streatham stations, while it is proposed that Streatham would see a peak service interval between trains of just two to three minutes. To maintain times to Sutton and Croydon, it is anticipated that 4 tph would continue to run directly from Streatham Common to Balham. So are we really going to see trains every two or three minutes through Streatham station in the peak? Where are twenty trains going to come from? On the current provisional timetable for Thameslink, four eight-car Trains trains from the Sutton Loop Line going to London Bridge and on to St. Albans and Luton. As Thameslink expands to cope with more passengers, surely these trains will go to twelve-cars, once all platforms are long enough. But Thameslink’s provisional timetable already uses all paths through the core, I can’t see any more trains on this route. At present between eight and nine in the morning peak, nine trains go between Streatham Common and Balham, so this might give us another five trains through Steatham, with four trains still taking the direct route. They will also be trains of at least ten-cars. So we now have nine trains of 10-12 cars trains going through Streatham. That still means that to attain a twenty tph frequency, we need to add eleven trains. Perhaps four tph could run between a Southern terminus like West Croydon and Clapham/Battersea/Victoria. This is the first of the Streatham stations coming into London. If the virtual tube was built, then inbound services to London would split here, with according to the Centre for London proposals, four tph would go via Balham and the rest would take the Streatham route. This Google Map shows the station. All services use the Eastern pair of tracks at Streatham Common station. Lots of fast services on the Brighton Main Line pass through on the Western pair of lines. Services to and from Steatham station curve away to the East. I think it could be a tight fit to squeeze a bay platform into Streatham Common station, to act as a terminus of the virtual tube. This is the second of the Streatham stations coming into London. It strikes me that the plan for a peak service interval of just two to three minutes is over-ambitious, although the Centre for London report is planning for 2050. Note that the capacity of a twelve-car Thameslink Class 700 train is eighteen-hundred passengers and that the next generation of trains on the Victoria routes will probably be similar in terms of passengers per car. In a couple of years time on the East London Line, the properly designed two-platform stations like Canada Water, Whitechapel and Shoreditch High Street, with the help of sophisticated modern signalling, will be handling twenty tph. So surely a well-designed two-platform station at Streatham could handle a similar number of trains! Provided of course, provision was made in the design to four-track the station if that was required in the future. I think that if it could be done, Streatham needs a single wide island platform, with London-bound services on one side and Sutton, Wimbledon, West Croydon and other services on the other. This would enable single-platform interchanges between all trains, just as is being implemented on Crossrail at Whitechapel. Escalators and lifts would provide step-free access to both sides of Streatham High Road. Remember the Thameslink trains will be walk-through as will probably be the next generation trains into Victoria, so most of the savvy passengers will position themselves correctly, when they board the train at their initial station. I think the problems will be more about passengers getting to the station, by foot, bicycle or bus, rather than in properly designed and rebuilt stations and on the trains. I took these pictures of Streatham station on the first of June 2016. There is a large bus parking area between the Streatham station and the Tesco next door, which could be developed into a full interchange. The station has little architectural merit. Opposite the station, there is a large gap in the buildings. The Morrisons supermarket next door is derelict and could be part of any development. It is a drab, dark station with all the style of a 1960s pedestrian underpass. It is one of those sites where any decent architect could create a practical and good station with the following characteristics. A wide island platform capable of taking twelve-car trains on both sides. Two sets of escalators and lifts, one on each side of Streatham High Road. Appropriate over-site development of flats or offices, that would enhance the area and help pay for the scheme. A proper bus station linked to the station. A design that would enable two extra lines and platforms to be added in the future. I’m fairly certain, that whatever Network Rail decide they want at Streatham to meet the required level of service, they will get. This is the third of the Streatham stations coming into London. If the tunnel is built between Streatham and Streatham Hill station, then the traffic through Streatham Hill in the morning peak could be. Which makes a total of 13 tph. These pictures show Streatham Hill station. It is step-free to both platforms and could certainly handle the required number of twelve-car trains. But I doubt there is no way that the layout of the station could be improved to allow passengers to go between West Norwood and Streatham stations, without going over the bridge. I think that a higher service between the three Streatham stations is a possibility, where perhaps four tph between Streatham Common and Balham are diverted through the three Streatham stations. This could be reinforced by extra trains from West Croydon and possibly Sutton. A rebuilt Streatham station would give cross-platform interchange with Thameslink and give services to London Bridge. At the northern end, the trains would terminate at one of these stations. Victoria – Is it too crowded though? Clapham Junction – Perhaps possible, but not the right place! TfL will pay their money and take their choice.